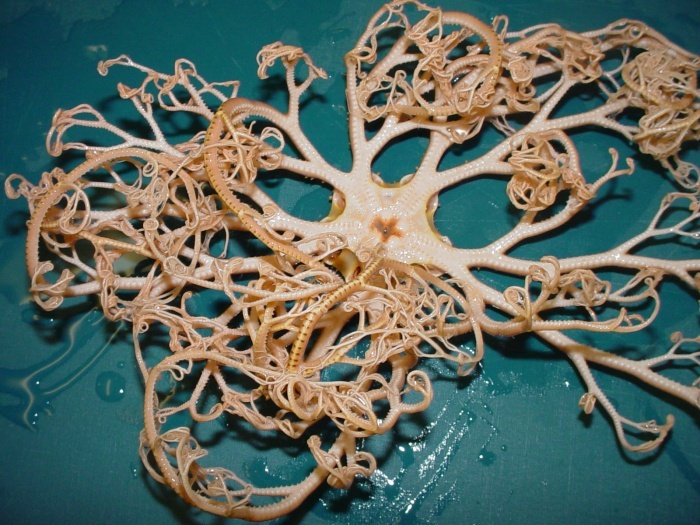 A basket star may not look like much of a star, but it doesn’t look like a fish either. So, don’t call it a star fish. It’s an echinoderm, and many of its relatives in the echinoderm a family of sea creatures often misnamed starfish because of the five or six pointy arms that make it look like a star. But sea stars is a better name for all of the echinoderms, some of which can have 20, or even 40 appendages. If they lose one, say it gets chomped on by a predator, they can grow a new one! They’re related to sea urchins and sand dollars, and they use suction cups on the bottoms of their arms to crawl slowly across rocks and corals. When they find something tasty to eat, like a clam, they can pry it apart with those strong arms. While there are lots of five-armed sea stars that live in shallow water, basket stars like the one in the picture usually live in the deep ocean. NOAA has a great photo gallery of deep sea stars captured by the expedition called Voyage To Inner Space.